Our desire is to see whole churches, cities, regions and nations completely transformed by the power of God and ignited with the fire of the Holy Spirit. We are presently affecting our city and region, and growing towards an international ministry called to the global harvest. GFC is helping spark revival fires throughout North America by demonstrating power in the ministry of healing, signs and wonders and prophetic revelation. We invite you to join us as we press forward in extending the Kingdom of God by doing the works of Jesus, awakening the Church, and building and equipping a generation of radical lovers of God who will see cultural transformation and spiritual break-through in this nation. Joseph Sturgeon and his wife Claire live in Cape Town, South Africa. Born in Birmingham, Alabama, Joseph has traveled the world extensively speaking in conferences, meeting world leaders and creating businesses. As a mentor, he has birthed churches and businesses and love being with people close to his heart. A lover of the outdoors and everything risky, Joseph thrives in an atmosphere where he can work hard and play hard while loving people to maturity. Pastor Ronda and the 9-City Glory Fire "Awakening Korea Tour" is starting April 18th to May 16th. Let's make it her best trip ever! Nine cities - nine trips. Nine has always been a special prophetic number in our life. I believe this will be a turning point of establishing something new there. If you'd like to support Pastor Ronda as she prepares for this incredible journey, please pray and sow into it at the top of the page on the donation button. Michael Danforth lives in Washington State and is internationally known as a prophet/seer of the new millennium. He is a prophetic psalmist, author, and revelatory speaker. Michael's insights into the mysteries of God, heaven, and a new heaven and earth, will challenge you to see the entire universe from an eternal perspective." Michael is also known for his razor sharp prophetic insight, and had been known to accurately prophesy new scientific discoveries such as new planets and other major breakthroughs in scientific discoveries. He is known as a high level seer who releases the amazing supernatural revelation that he sees in both prophetic words and in anointed prophetic worship. Bro. Mark Machado began to serve God in his late twenties by pastoring a church in his home in the San Francisco bay area of Northern California. After graduating the Rev. B. G. Leonard full Bible Course of twenty-six subjects he was then ordained by Christian Training Center of Texas. He now serves as President of the same Training Center. Having traveled to many countries where he has led many souls to Christ, he sees much success in signs miracles and wonders because God gave him a zeal with the knowledge of the Truth of God’s Word. Bro. Mark Machado now lives alone in his home in South Texas where he faithfully continues to carry on the work of Sister Evelyn, including publishing Brother Leonard’s long-awaited books. Dave Fenton currently serves as an associate minister at Flametree Church in Nambour on the Sunshine Coast in Queensland. He is a gifted communicator who mixes natural humor with profound scriptural insight. Recognized nation wide as a minister with a prophetic anointing, Dave’s heart for God and His presence is infectious. Dave and his wife Angie have one daughter, Lily-Anne. ​Pastors David & Ronda Ramer got to know David many years ago while working for Streams Ministries in New Hampshire with John Paul Jackson. Corina Toncz-Pataki iIn her desperation to have more of Him over two years ago, Corina entered into a new season of deep encounters with the Lord, Jesus. He started unveiling and teaching her the mysteries of His Kingdom realms and of His government, the position and function of our true identity IN CHRIST, our job as sons and the supernatural ability He has placed in us, that we all have not YET tap into, but it’s coming! During that season, the Lord gave Corina a mandate to go and teach identity, at a much deeper level…to go teach on our identity as His sons of light, to all that are ready for more, to all that are hungry for all of Him, and to all that are ready to step into the deep mysteries that the Holy Spirit is revealing NOW. These things have been hidden from human understanding, even the bottomless things of God, that the Holy Spirit is revealing NOW, to the spiritually matured ones. For then, eye has not seen and ear has not heard, those things that the Lord has prepared for the ones that are ready to come up to a maturity level in Christ and step into Sonship, to bring the government of His kingdom into all creation and release His glory. 1 Corinthians 2:6-10. Artwork by James Nesbit - used by permission. David & Ronda Ramer have strong apostolic authority with a prophetic voice for the region. They are gifted teachers with deep insight in Biblical revelation and dream interpretation. They have traveled extensively ministering the gospel in 38 nations with salvations, healings and miracles. With a powerful prophetic anointing, they release the fire of the Holy Spirit and bring fresh passion and hunger for Jesus Christ everywhere they go. 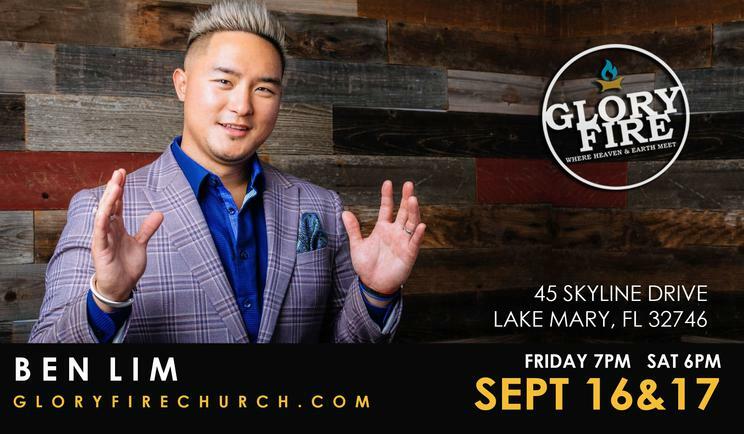 Currently, they pastor Glory Fire Church in Sanford, Florida and travel nationally and internationally as itinerant ministers having a heart to see the presence of the Lord and His glory fill the earth bringing transformation to churches, cities, and nations. Darby Slaton is a Life Coach, dynamic speaker and motivator for parents, teachers, caring adults, and young people. He has spoken over 800 events in the past 5 years. He combines storytelling, humor, and practical strategies to inspire change. After growing up in poverty, struggling with schooling, anxiety and deep depression, he has gone on to participate in more than 800 inspirational events and provide a measurable positive impact on schools, families, and communities across the east coast. His keynote program Rewrite Your Story is an inspirational experience designed to engage and empower today's generation, promote self-ownership, encourage discovery of purpose, and to build more grit into individuals. This interactive presentation uses the elements of visual storytelling (graphic facilitation), storytelling, drama, humor, pop culture and science. A lover of coffee, chocolate, and creating art, Darby is married to his best friend Colleen, a fellow neuroscience geek. They live in Lancaster, Pennsylvania, where Colleen serves as an occupational therapist and works with children with special needs.